Contemporary villa, 5 minutes walk from the village, 4. 5km from the sea. A bright and spacious villa with 2 bedrooms, close to the ocean. 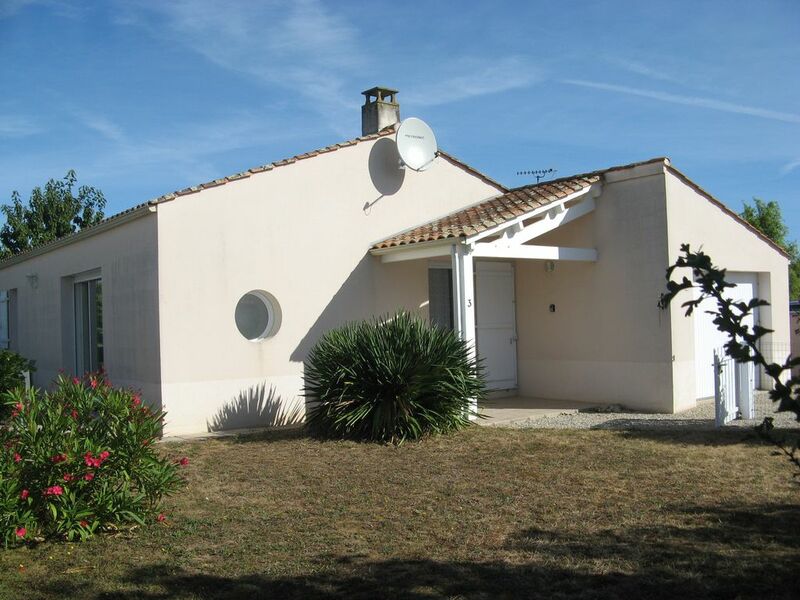 The villa is of contemporary style Vendee, very well equipped recent. 1 bedroom (bed 140 x 200), 1 chamber 2 bunk beds with trundle bed (beds - 90 x 200cm), 1 bathroom, 1 separate WC, 1 kitchen with dishwasher, oven, microwave oven and a bar -Snack .Table and 6 chairs, leather sofas and TV. South-west facing terrace. Garage with washing machine. Private garden, closed. The house is located in the small village of St Hilaire la Forêt, in the Vendee. The village, with a fascinating history, is close to the ocean and beautiful beaches. Located in the town square, 5 minutes walk from the house, there is a church, the town hall, a food shop and a bar. The shop sells fresh baguettes and croissants every day. There is also the Museum, Cairn - Prehistory Centre next door or you can discover the country of the megaliths otherwise with exhibitions, events and a lot of activities to do with family or friends. From the village there are several bike paths that take you to Jard sur Mer and its Port, Longeville sur Mer and the beautiful beaches of Le Bouil, the Rocher and the Conches pass through fields full of corn and sunflowers. This holiday home has everything for the family. We had a pleasant stay here. Very clean and new, a home from home. We did have a slight issue but we were seen to in very timely manner and we were very pleased with quickly the problem was resolved. If you want a quiet, relaxing holiday then we highly recommend staying here. Ideal for a driving holiday! Hopefully we can stay again next year! Nous avons apprécié notre séjour au sein de cette maison. Le descriptif était conforme à la réalité. Jardin appréciable également dans un lotissement calme. Een netjes ingericht huis met ruim voldoende voorzieningen. Wij (een gezin van 4 met twee tienerdochters) hebben een fijne week gehad in de vakantiewoning. Het huis is netjes ingericht. Nette keuken en badkamer. Terras aan de zijkant van het huis. Hierdoor heb je de hele dag zon. Enige nadeel is, dat de achtertuin grenst aan een doorgaande weg. Hierdoor hoor je, als je buiten zit, het verkeer. Hier heb je binnen geen last van. St Hilaire la Forêt is a small village in the Vendée, with fascinating history, close to the ocean and beautiful beaches. Located in the square, 5 minutes walk from the house, there is a church, the town hall, a food shop and a bar. The shop and bar selling baguettes and croissants every day. There is also the Museum, Cairn - Prehistory Centre next door or you can discover the country of the megaliths otherwise with exhibitions, events and a lot of activities to do with family or friends. Leave the village there are several bicycle paths you are to Jard sur Mer and Port Longeville Sea and the beautiful beaches of The Bouil, the Rock and Goms pass through fields full of corn and turns to the sun. Location de linge de maison (draps et serviettes).